I’ve started the outside window work that I want to complete this fall… storm windows. The goal is to replace as many of the crappy storm windows as possible. I set up the scaffolding below one of the windows in Ben’s room and took off the storm window. I am taking the time to paint the trim when the storm window is out. 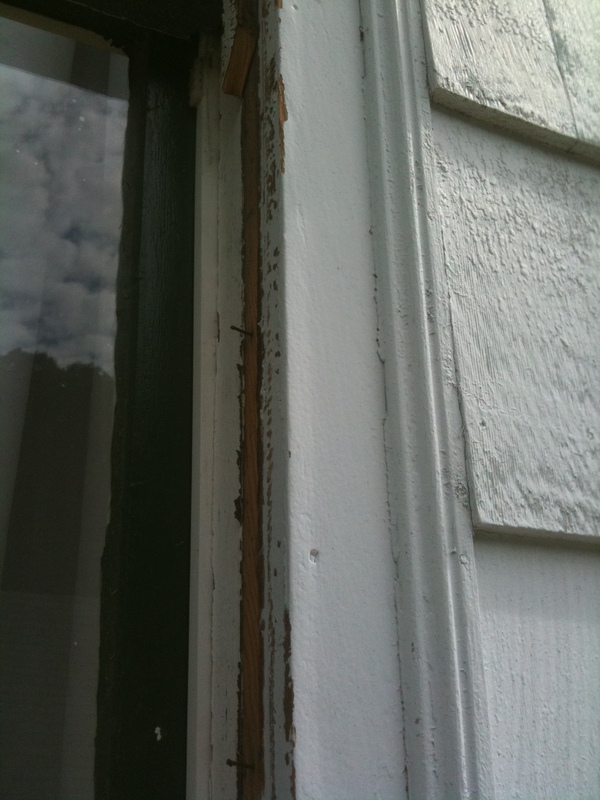 When I removed the storm window, I found the exterior stop cracked. I pulled out the bottom half of the stop, and milled a replacement (which I installed this week). Note to self: it would be much easier to install the stop with a nail gun next time. It was a real pain to hold the stop next to the window and nail it in on the same time…. a nail gun would have solved that problem. It doesn’t help that the scaffolding is a little short for working on that window as well (yes, I’ll get pins to stack the scaffolding before the next window). Susanna and I decided to paint the trim green around the windows. It looks much better – I’ll take pictures the next day it isn’t raining. We are thinking about painting the storm windows brown. This past weekend I dug out one of the old original (wooden) storm windows to replace one of the broken aluminum storm windows in the living room. I removed the glass and primed and painted half of the storm window. Next to paint the rest and hang the window. I ordered more glazing compound and a new style of window hanger (they look much better than the ones I had been using). I also ordered some weatherstripping to put between the storm window and the stop. This weekend I’ll get the brown paint for the storm windows, and hopefully get some of the storm windows installed and more of the trim around the windows painted. Thursday I’ll swing by the glass store to get replacement panes for the original storm windows and see my options for removable panes for the storm windows on the second floor… Let’s see how much I get done before the weather gets cold.